This course is intended to train responsible armed citizens to better protect themselves, their families and their homes in everyday situations. The course will take you beyond the basics and will instill the cutting edge mindset, tactics and drills necessary to enable you to survive a violent confrontation. The course will include two days of world class pistol shooting instruction involving hours of realistic drills designed to increase your situational awareness and instill confidence in your firearms handling ability. 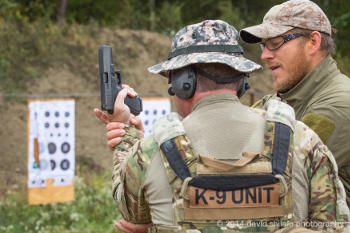 It will cover topics such as mindset, gear selection, proper pistol handling, intro to combatives, pistol draw, shooting, shooting and moving, and basic medical. ATSI's owner and lead instructor is Bill Rapier. He is recently retired after twenty years in the Navy, where his duty assignments included several years at SEAL Team 3 and over 14 years at Naval Special Warfare Development Group. Positions held include assaulter, breacher, sniper, team leader, troop chief and military working dog department senior enlisted adviser. He has always been an avid shooter and is heavily involved in combatives. Course details and registration: To Register please email bill@amtacshooting.com or email him for further information. Lease a Car Islamabad Airport associations have ended up to an extraordinary degree perceptible in view of the diligently developing needs of transportation. This has occurred into number of rental auto associations appearing in the business part to offer their organizations. Rent a Car in Islamabad With the tempest of such an extensive number of rental auto associations it persuades the chance to be every so often hard to pick the best auto rental affiliation.